So I had a finish! 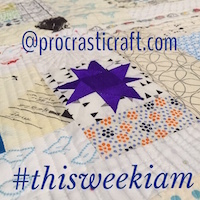 Some of you will have seen this quilt on Instagram and Facebook – I’ve been rather slow to getting it here! 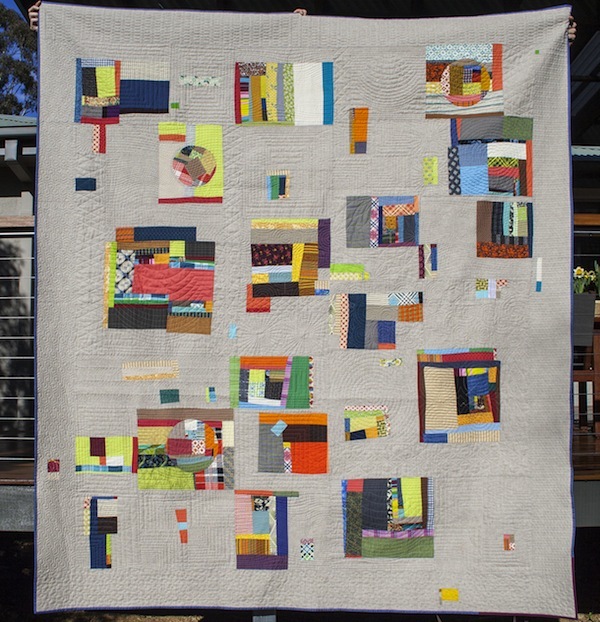 This quilt feels like one giant material representation of my online experience, a place I’ve made incredible connections to inspiring, funny, kind and generous people. I am in love with it for its symbolic nature as much as for its beauty. So, it’s a bit of wordy story but I’ll try my best to stay on track. 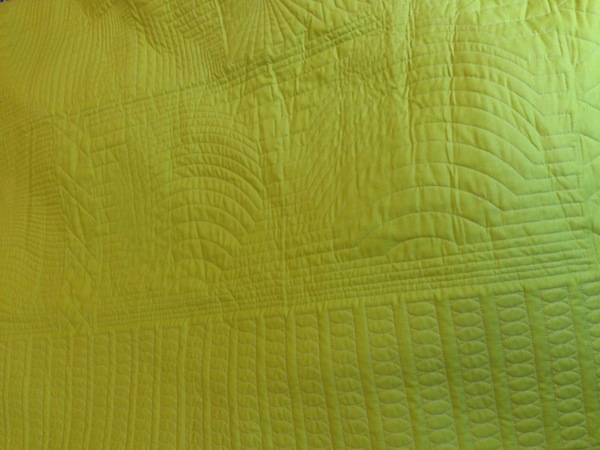 I began making this quilt in a Denyse Schmidt class at QuiltCon in February 2013. The same class in which I met dear Charlotte. We were volunteering and it being the last day of QuiltCon, some participants left early to catch flights home. Fortunately for us, we were able to make a few quick blocks. I left thinking I might have just enough to make a lap quilt if I was careful about how I joined them. I was clearly overly optimistic about how much I’d done that day! That proved to be a fortuitous move on my part. The ever inspiring Cheryl Arkison (have you seen her gorgeous book, A Month of Sundays) saw that photo. Cheryl is one of the lovely friends I have made online who I met in person at QuiltCon. She was also in the DS class and had grabbed a couple of orphan blocks at the end of the day and she was willing to share her leftovers! They arrived along with the most generous parcel and sweet words I think I’ve ever received. When I opened the box, I was super thrilled to see that Cheryl had made some of the blocks into inset circles (check out her Craftsy class to see how to do these, it’s pretty clever). So, those circle blocks up there came to me via Calgary. It's here!!!! @goneaussiequilting I have the parcel and I LOVE it, thank you so much 😍. Can't decide on bindings… The black on the bottom right rouge blue/red on the top right? Help??? As soon as I had those extra pieces, I knew exactly how to make the quilt. I pulled out my Essex linen, laid out a king size piece on the deck and literally threw the blocks and fabric scraps into the air to see where on the quilt they landed. Of course, some landed on top of each other and some were either too far apart or not far enough so I played around with placement just a little and then stitched them up. Quilting in progress by the fabulous @goneaussiequilting! The 7yo just asked me "is Jeannette a famous super-star quilter?". Yes, indeed she is. And I love that my daughter knows that great quilters are like rock-stars! In the end, I have a king size quilt for our bed in our new home. It is spectacularly large, the biggest quilt I’ve ever made and I’m so damn proud of it! Blocks :: Scraps provided by Denyse Schmidt and Free Spirit, made by Julie McMahon with blocks contributed by Cheryl Arkison. The Name :: Started in Austin with fabrics from a studio in Connecticut (USA) and sewing time with a friend from London (England), blocks from Calgary (Canada), made in Canberra (Australia), quilted in Bombala (Australia) :: truly an effort from Faraway Fields. This entry was posted in Denyse Schmidt, quilt, quiltcon, quilted, quilting, scrap, scrap quilt and tagged collaboration, denyse schmidt, quilt, quiltcon, Quilting, Sewing on June 6, 2014 by procrasticraft. Sigh… so many good things. The memories, the play, the quilt. Perfection. And… NOT LONG TIL WE DO IT ALL AGAIN!!!!!!!!!!!! What a fantastic quilt! Those made with friendships and good thoughts really are the best aren’t they? And the quilting is just fantastic! Couldn’t be more perfect. Thanks Michelle, as someone whose work I admire, that means a lot. And yes, they sure are the best. It is just so gorgeous Julie – I didn’t get to the show, but this was my absolute favourite from the photos I did see. 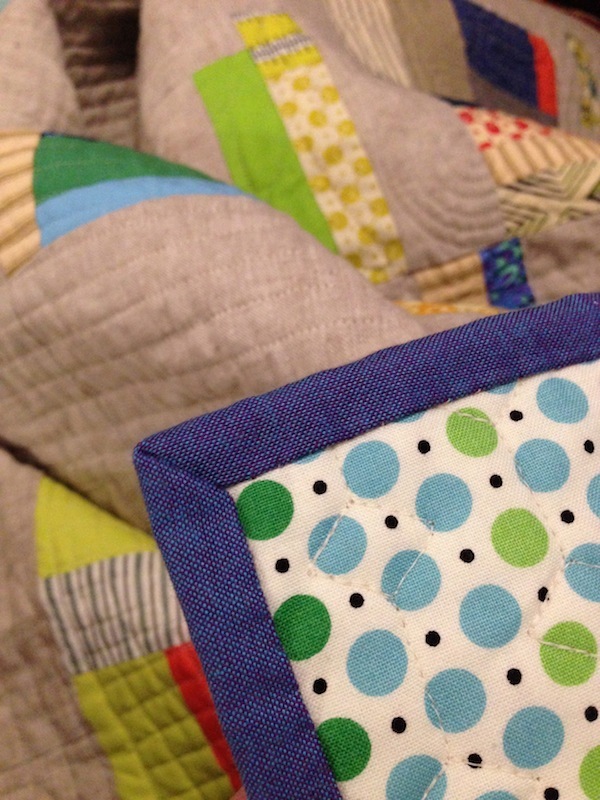 Your design is just so interesting and Heidi’s quilting complements it so perfectly. I’d love to see this one in person – I hope you’ll enter it in quiltcon! Julie! This is absolutely and insanely marvelous! Separating those colorful blocks with grey was a fantastic idea. Met you at QuiltCon last year….will see each other QC2015!? Great quilt -pretty cool souvenir from Quiltcon. Thanks for stopping by Laura, love the name of your blog “frou-frou” is a common term around here with three daughters in the house! As a teenager/young adult, my friends use to tease me that I only liked things that were frou frou. Yay for you Jules! That’s one truly awesome quilt you’ve got there and the ‘in the making’ story that goes with it is just a good. King size huh? Something only a long-arm quilter would love to quilt? Bet is nice and heavy..perfect for out Canberra winter. 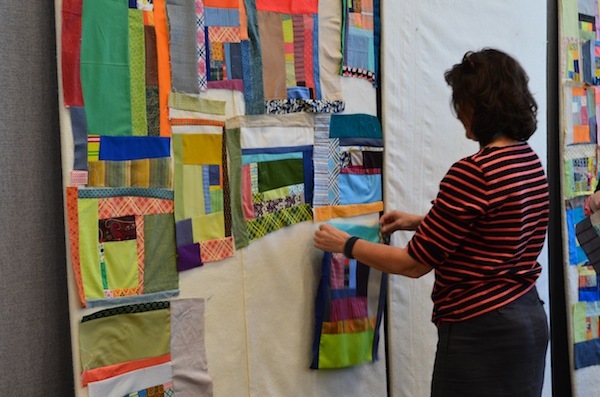 I’m looking for a long arm quilter so will be sure to check Heidi’s site out…. Thanks for sharing. Am looking forward to catching up with you at the next meeting.